It was the end of Spring Break 2014. 45 members of the Hoofers Sailing Club and I had just spent 8 days sailing four 40+ft catamarans from Ft Lauderdale to the Bahamas and back. As any good story goes, we were drinking. 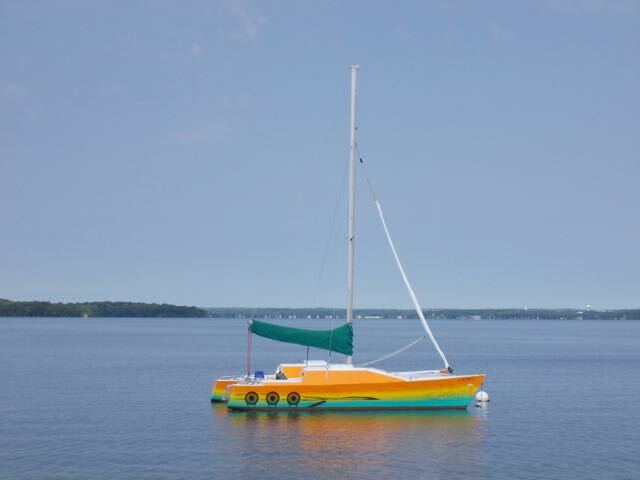 The next thing I know my mind was made up in finding a the smallest catamaran that I would feel comfortable cruising the Caribbean. 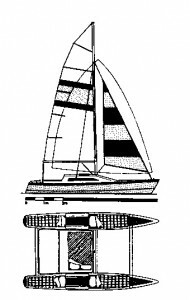 Having extensively sailed a 37 ft Catamaran around the world in 2000-2002 I was already sold on the virtues of catamarans. I was looking for something smaller and with a significant smaller cost of ownership. I was very excited when I saw a video of Richard Wood’s epic sailing trip. That pretty much sold me on his design and pretty much gave me the confidence that his design choices and tradeoffs would be in line with my needs. I took a good look at his newer designs but Shadow kept calling my name. 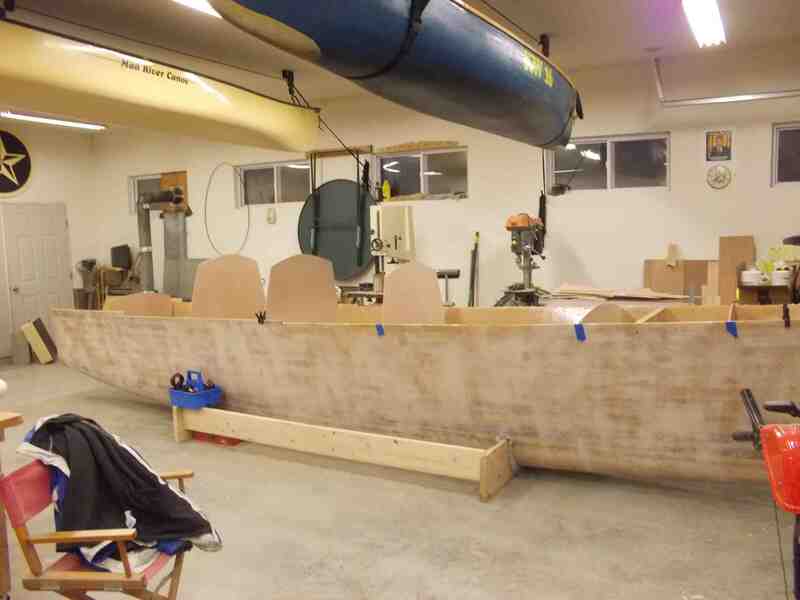 Safe for coastal cruising, fun to sail, easy to build, trailerable, and good looking! What else could I ask for? 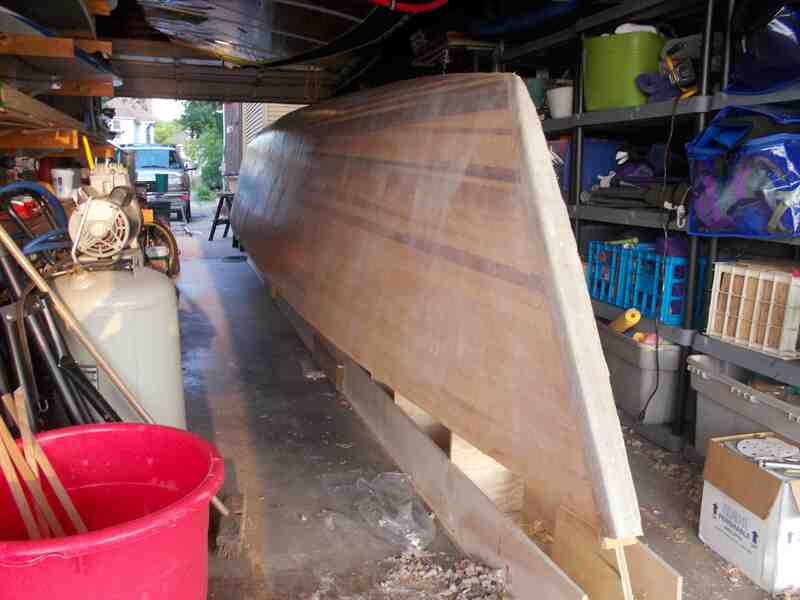 The original Shadow was designed to be a cold-molded plywood hull. Since then builders have successfully experimented with many different construction techniques. 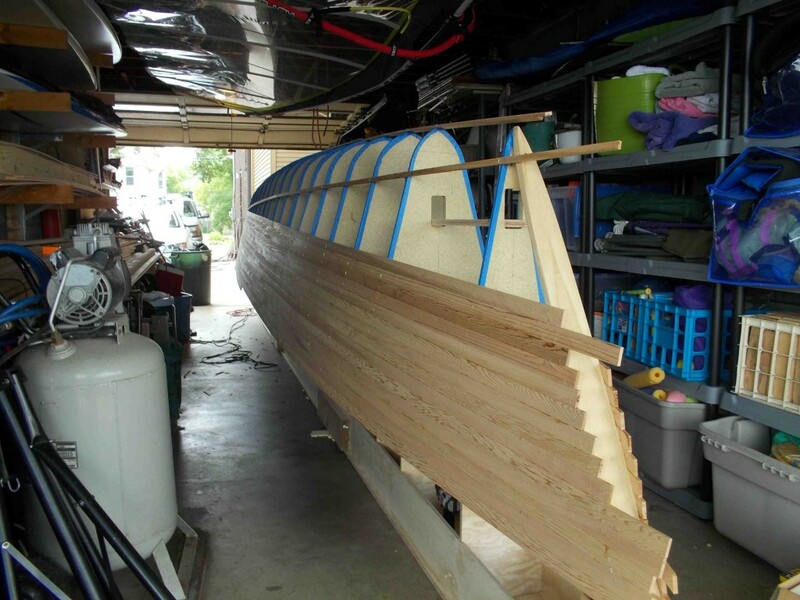 I chose to go with the strip composite method simply because I have experience building smaller boats using this technique. I have a high level of confidence that I can build a fair hull. Price wise I actually think it is about 30% more expensive mostly due to the extra epoxy to sheath the whole hull as opposed to just the bottom. 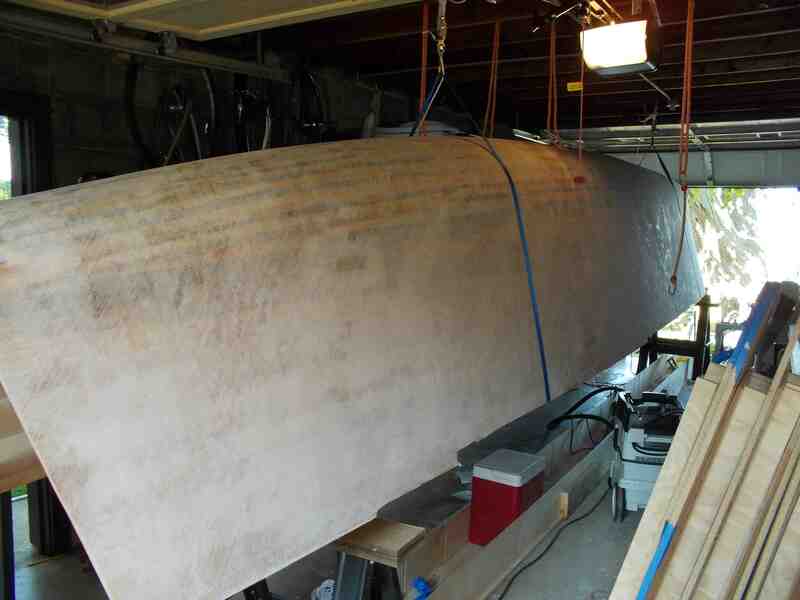 Note: now that I have finished both stripping and fiberglassing both hulls I can say that I am happy with my choice. 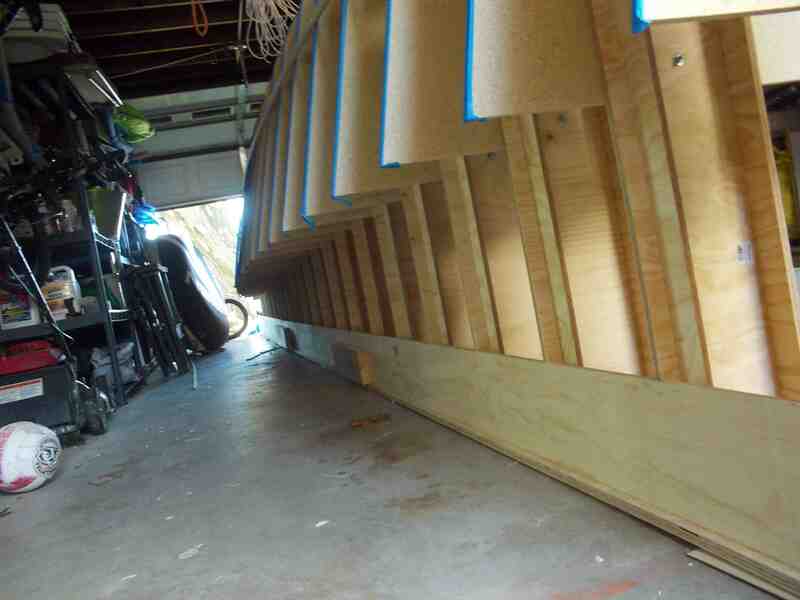 I finished each hull in about a month working most weekdays for a couple hours and weekends 6 hours a day. Basically I would set a couple strips in the morning, then a few more after work, and a last batch before calling it a day. 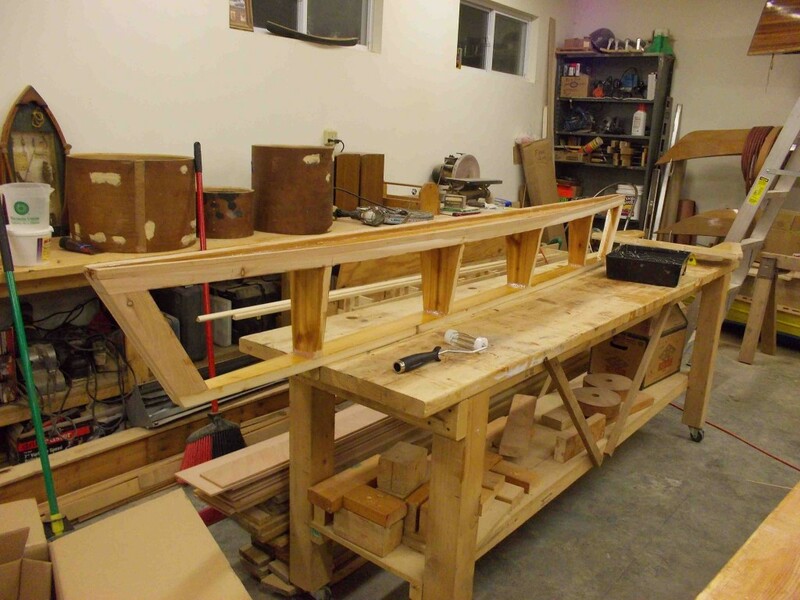 Each time I added 1-3 full length strips depending on the placement. You have about 50 strips on each side to add. There is no getting around it. 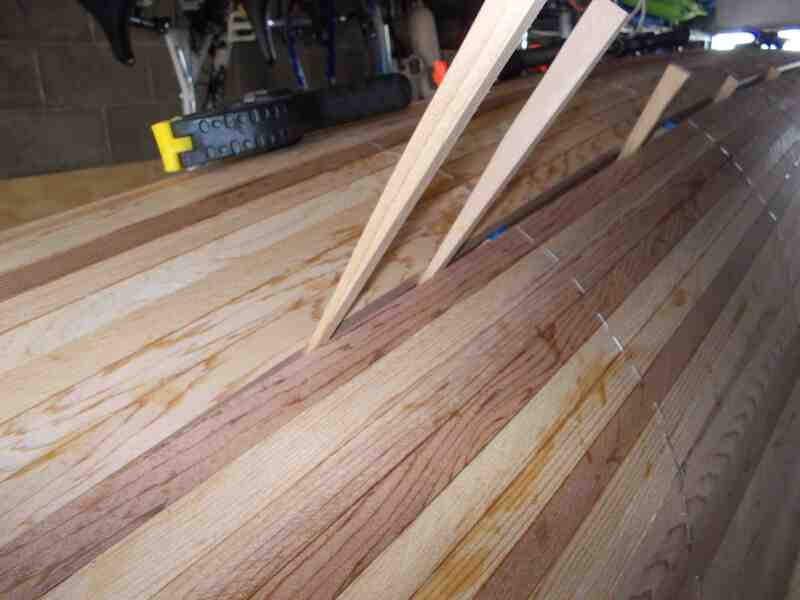 If you are building a strip composite boat you need to cut strips, lots of them. For the Shadow I ended up cutting and glueing approximately 500 strips. 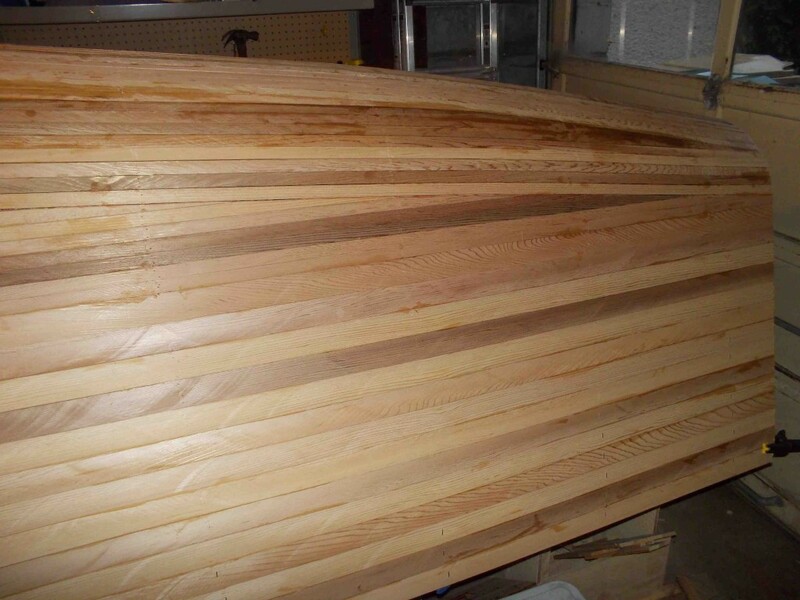 It all starts with the best lumber you can find. 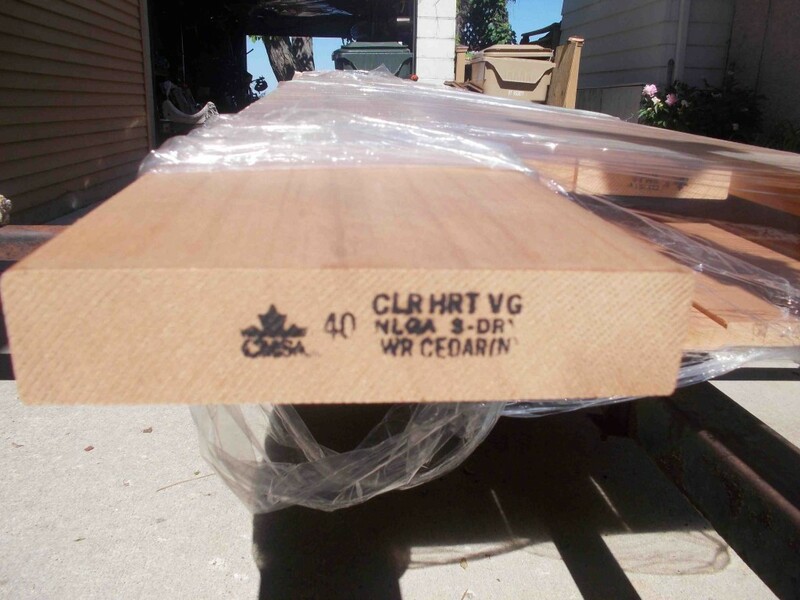 In my case $2000 worth of clear, vertical grain cedar procured through my local lumber yard, McCormick Lumber in Madison, WI. A combination of 1×8 and 2×8 of varying lengths from 8-16ft. Mostly 12 footers but since you are staggering the joints the other sizes come in handy. Then set up your table saw as best as you can. 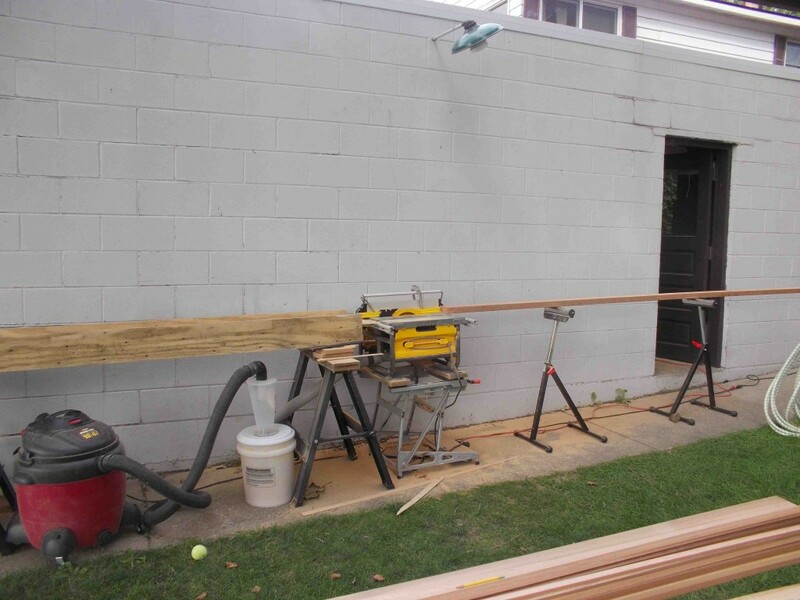 It is very helpful to have a very long fence to help you feed the boards. 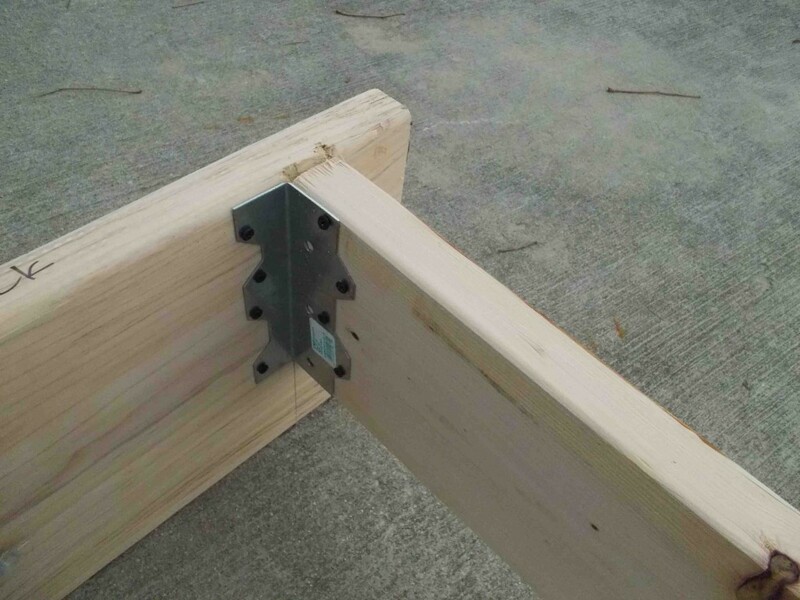 Here I clamp my level to extend my fence. 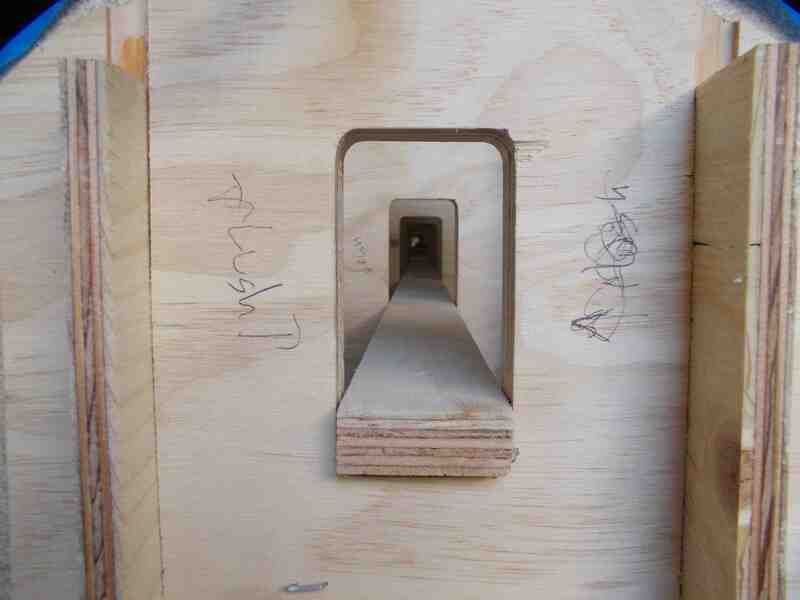 I also found that the Gripper pushblock was a safe and effective way of moving the board through the table saw. 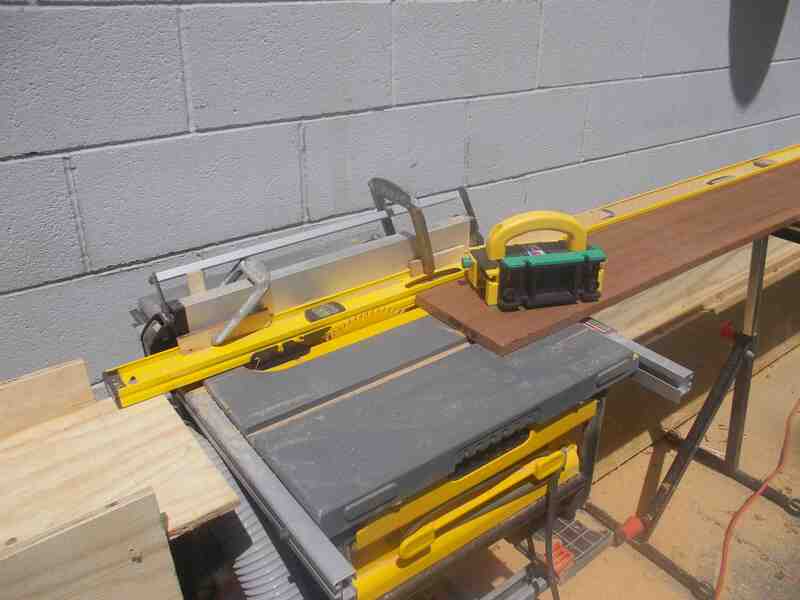 My Dewalt DW 745 compact table saw with a 80T fine cross cut blade had more then enough power and made it so that I did not feel like I needed to plane the strips. 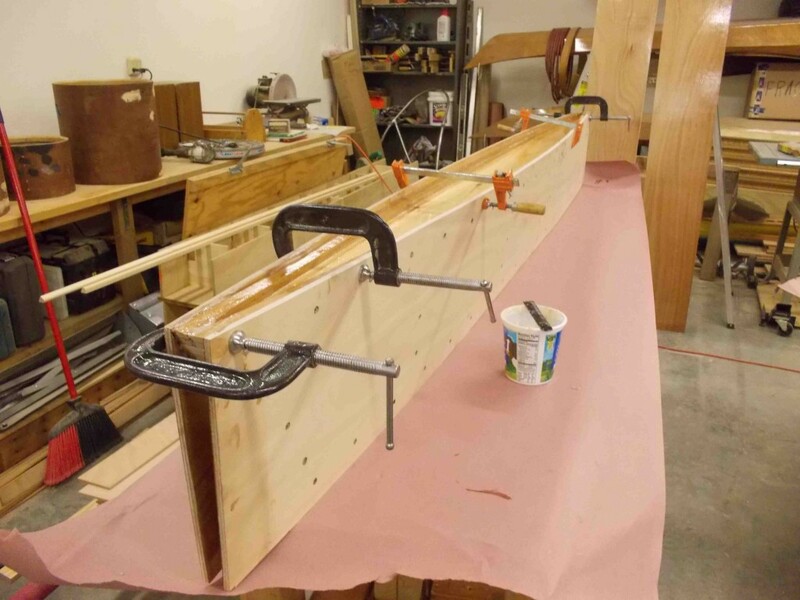 Rollers on the feed side and a plywood box to contain the strip as it comes out. Also notice the shop-vac with a Oneida Dust Deputy Cyclone to help control the dust. The cyclone works great, and very little dust actually gets to the shop-vac. I just had to remember to empty it after every other board since I was generating that much dust. 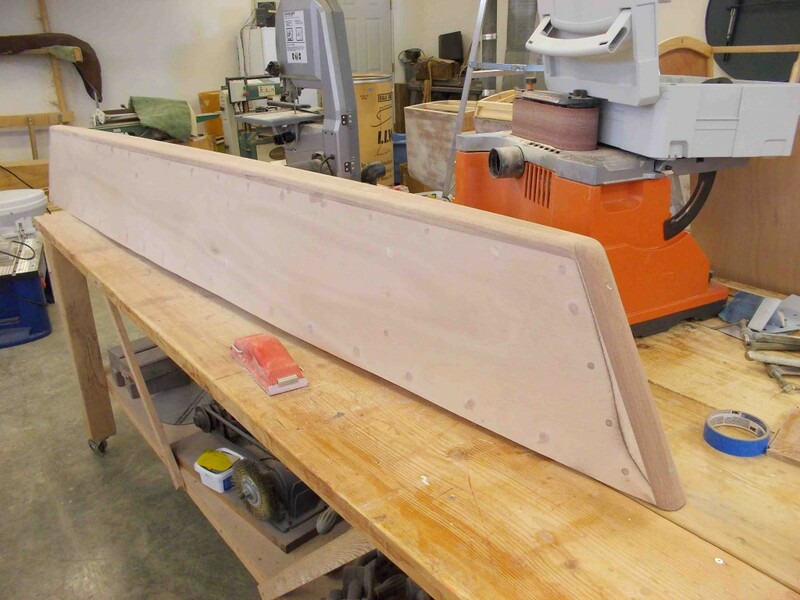 After milling a 8 inch board, I get 16 – 5/8″ strips and a little bit of waste. 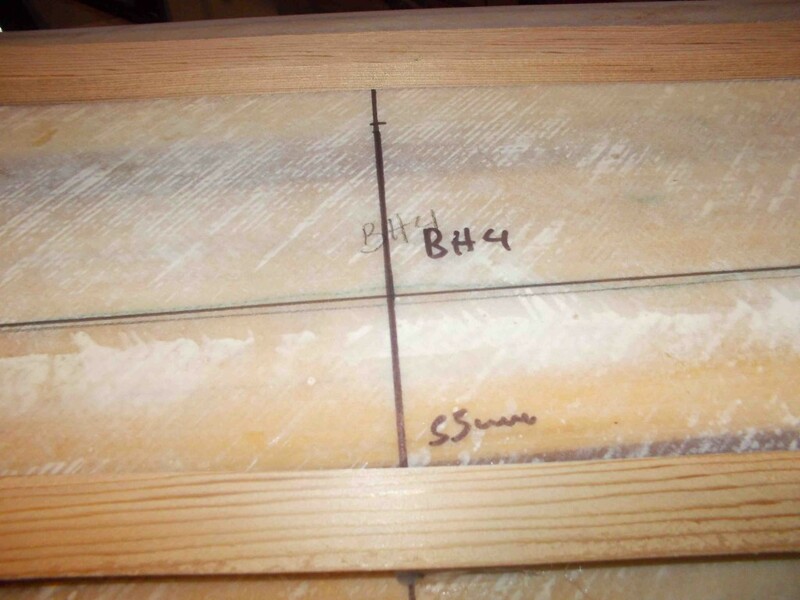 The kerf for my saw was 1/8″ and the math adds up. Also since my original boards were surfaced, I have one strip that has rounded edges. 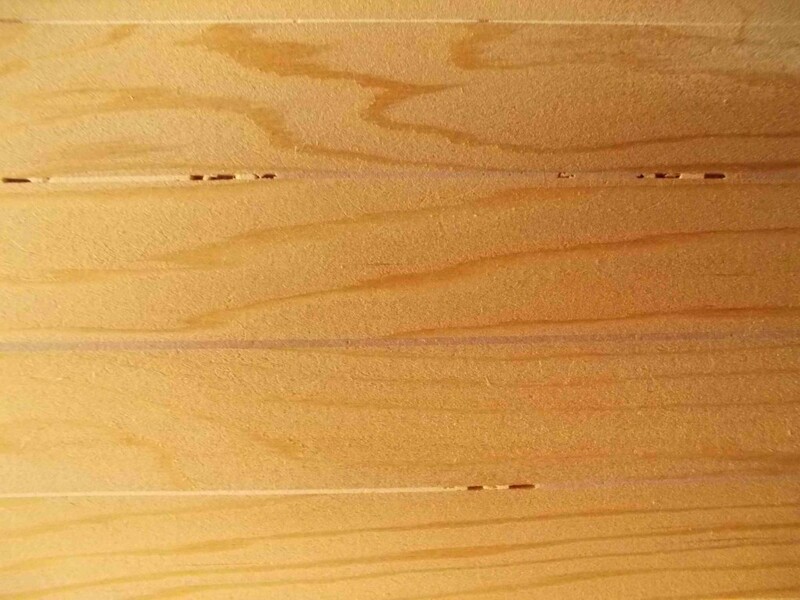 I ended up not using the strip with the rounded edges thus getting 15 strips per board. 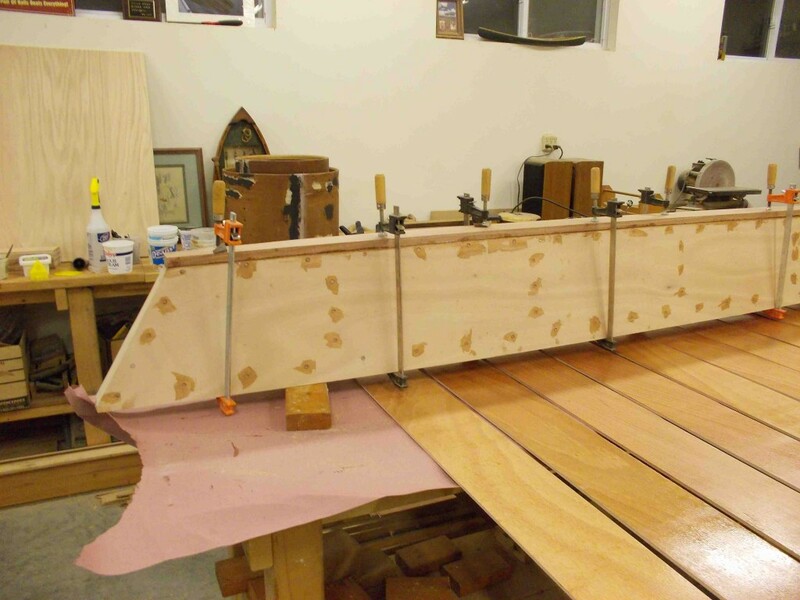 For this boat, I did not bother to bead and cove the strips, since that is unnecessary in the flat sections and in the curves sections a quick pass with a hand planer gave it the appropriate bevel for the strips that needed them. It is a tedious process and it took me about 16 hrs to cut all the strips. It goes a little faster with an extra hand. 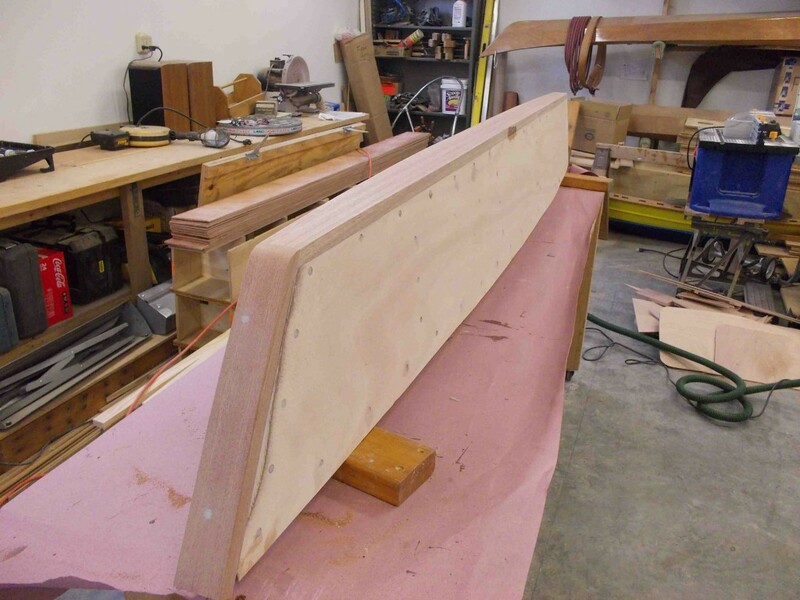 It is critical that the infeed rollers and out feed box are level and square, otherwise the board tends to want to slide out and you will end up with a skinny strip. 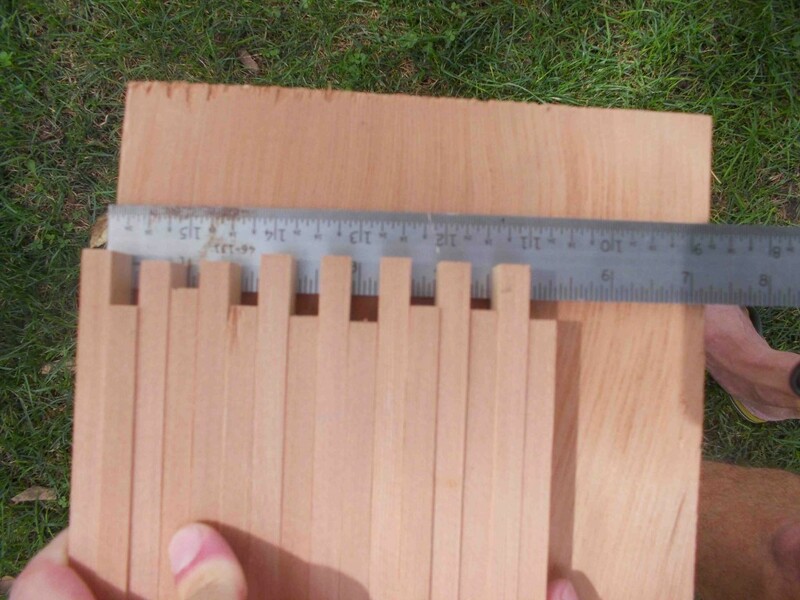 If you have a power planer and want to mill the strips to an exact thickness that could be helpful, but I found that my strips were good enough coming straight out of the saw. I ended up with a few skinny strips but the problem seemed mostly to be at tail end of the board, and I just cut out the offending end. Lesson #1 from boat building. Always do the most accurate and best work you can, so that when you screw up, which you will, it is just not that big of a deal. Setting up frames starts by drawing them as accurately as you can from the blueprints. Richard Woods has a simple way of drawing his stations and one can easily draw them without lofting the boat. 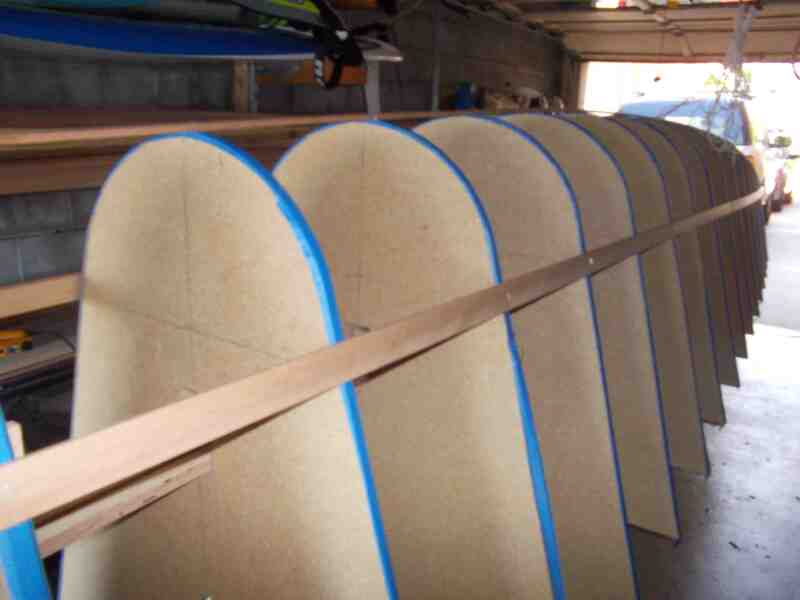 The frames are drawn on 5/8 particle board and cut out as accurately as possible. As part of the design I added a sighting hole and two screw holes that will allow me to place the frames on my strong back as accurately as possible. 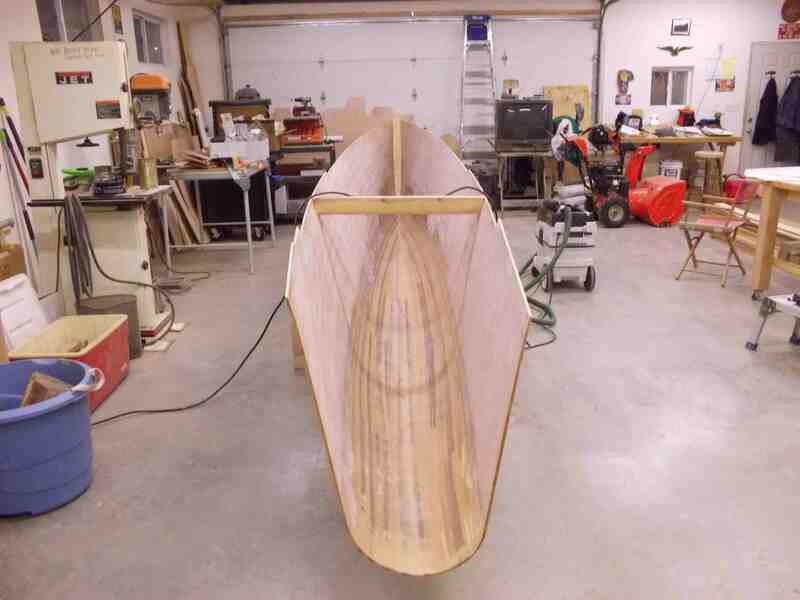 If you pay close attention you will see that I decided against adding the knuckle on my boat after carefully considering the work and complexity involved. 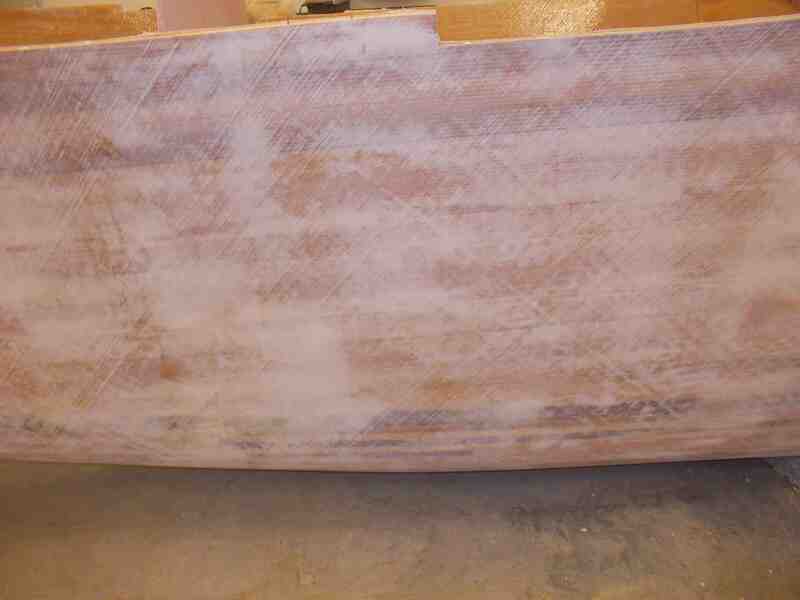 View of the plywood box strong back. Notice that at this point all frames have been covered in blue masking tape in preparation for stripping. I had a couple frames that ended up a little off. The time to fix it is before you start planking. I found that temporarily adding a shear strip, waterline strip and a center line strip quickly found the offending forms. 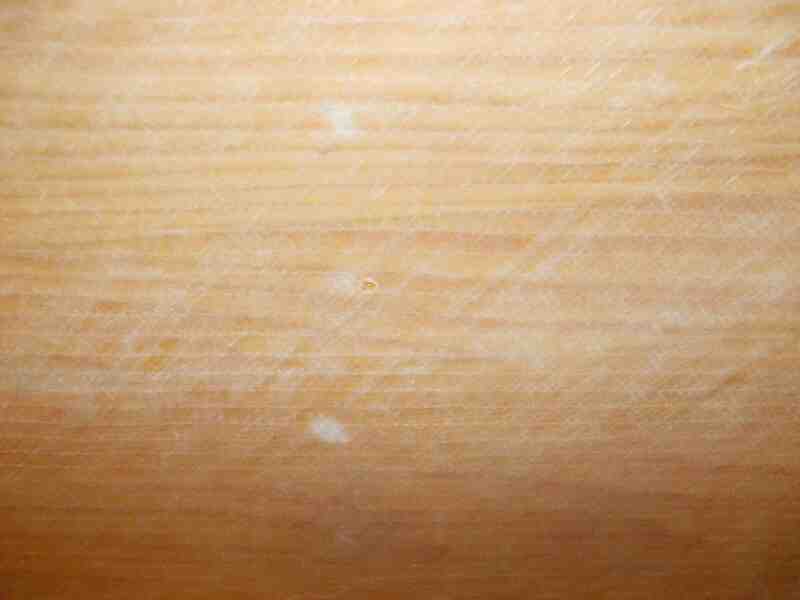 Here you can see the staple holes. I used Elmers latex based wood filler and that proved to work well. 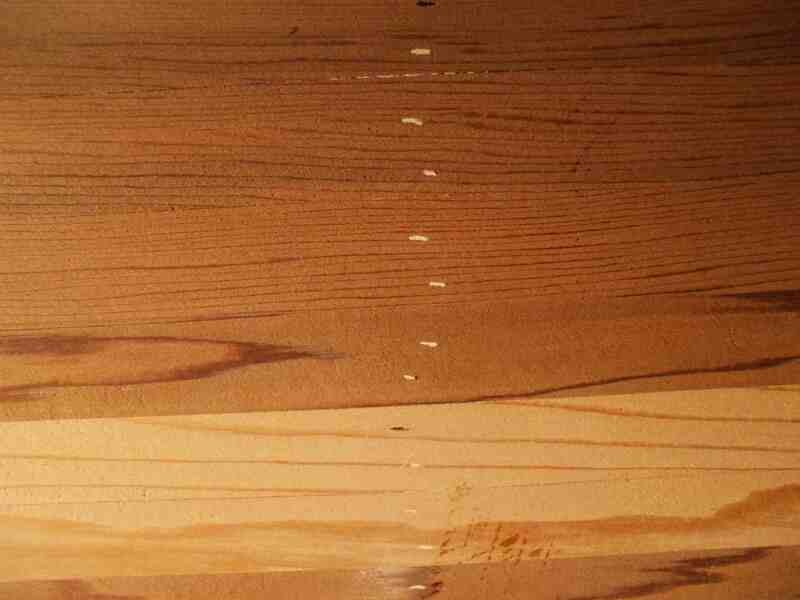 If you don’t fill these cracks and pin holes, they all translate into bubbles as you lay the glass down. 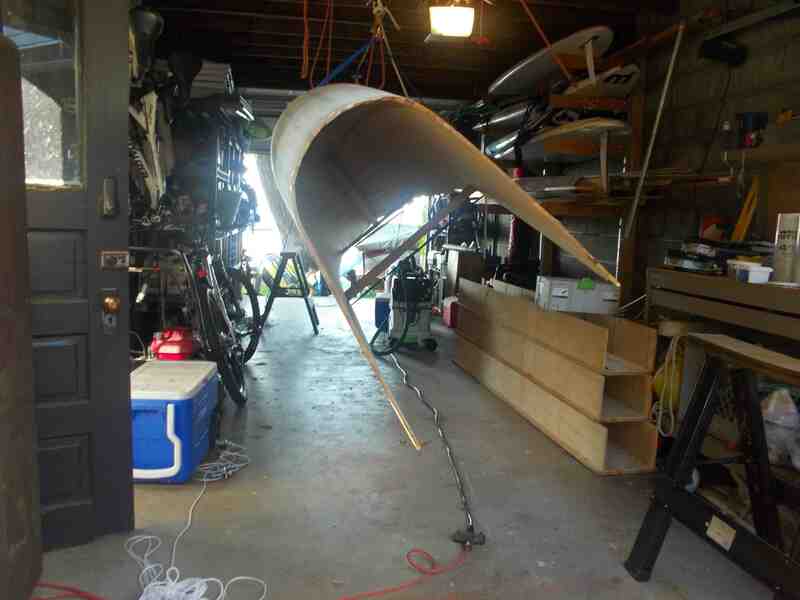 Fairing the outside is much easier then the inside. One of my best investments for boat building has been the festool line of sanders with their vacuum cleaners. 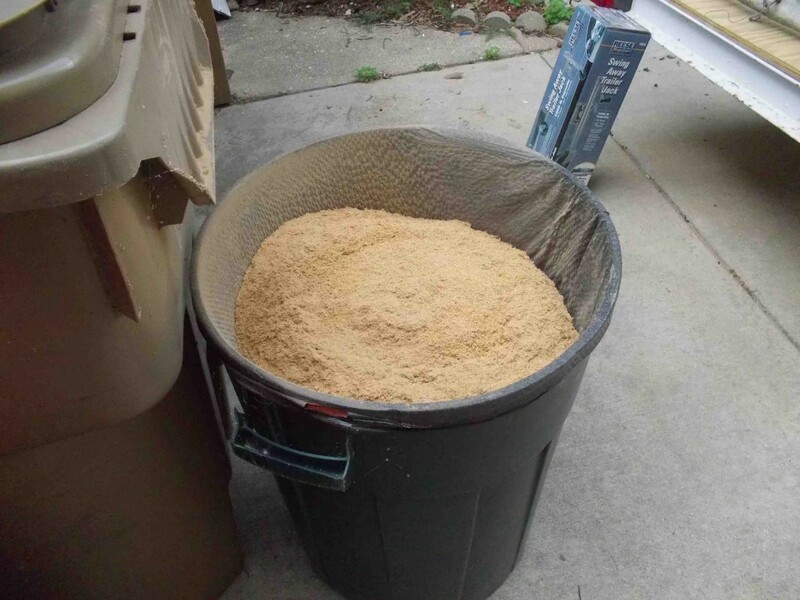 These sander worked as advertised and the dust inside the garage was minimal. For the outside the ETS 150/5 EQ Random Orbital Finish Sander with 80 grit sandpaper worked great. The inside can be a real challenge if you did not clean the glue as you stripped. We started by trying to work under the boat. We quickly realized this wasn’t healthy… For sanding the interior, another festool sander came to the rescue. Rotex RO 90 DX Multi-Mode Sander. With its small profile, light weight and polishing soft pad it did a great job of cleaning and smoothing the insidie radius. 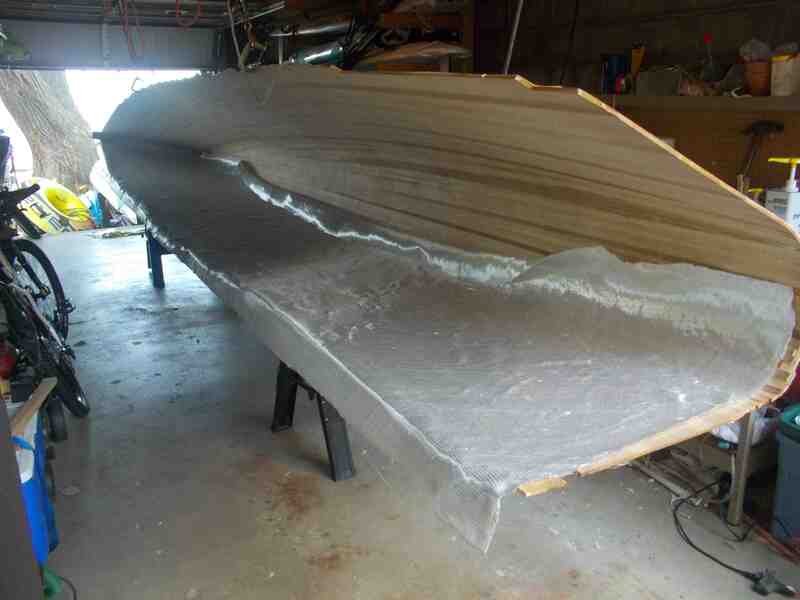 Glass ready to epoxied. 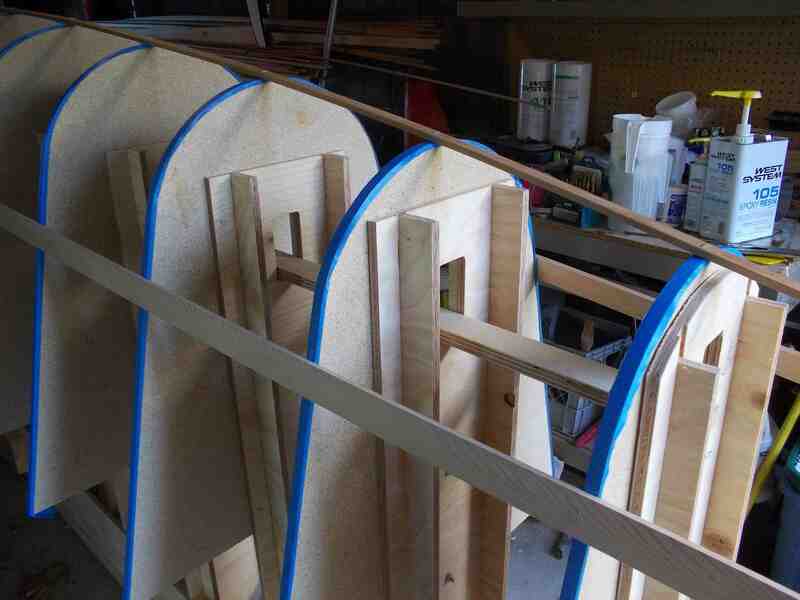 Use a little blue masking tape to hold the curling edges in place. 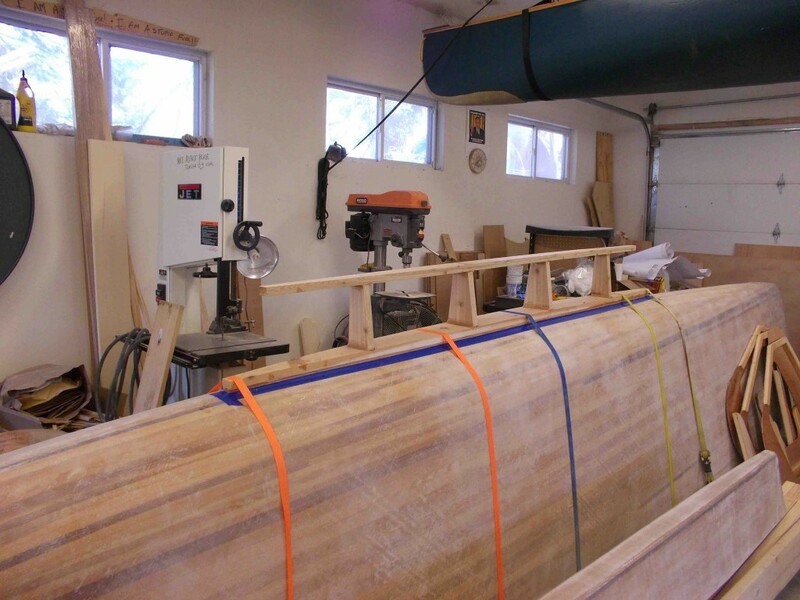 Popping the hull out of the mold once the outside glassing is done and rotating it to work on the interior. 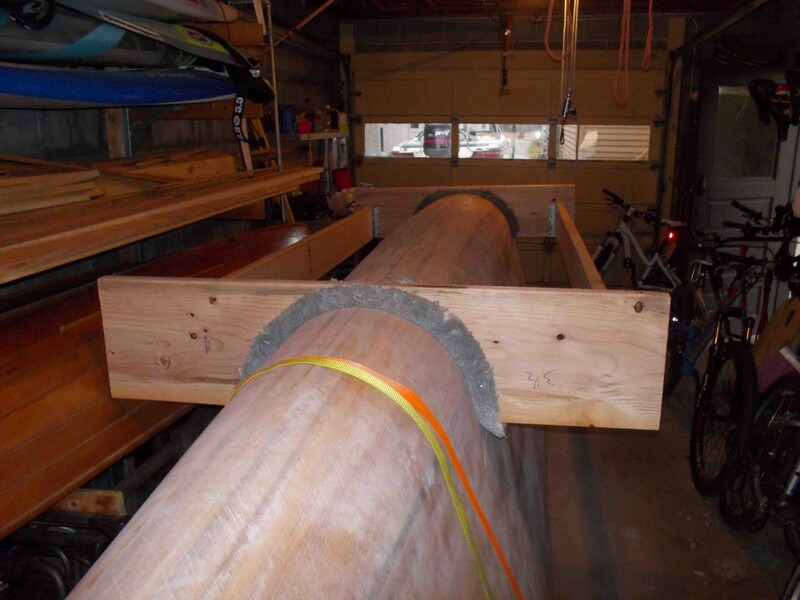 Notice the straps are braced against the temporary spacer boards to prevent the hull from being crushed. 1) Pick the right day – The perfect day is about 70 -80 degrees, low humidity, slight breeze. If it was a cold night you will have to wait till the day warms up. Never work uncovered where the dew can settle on the boat at night. 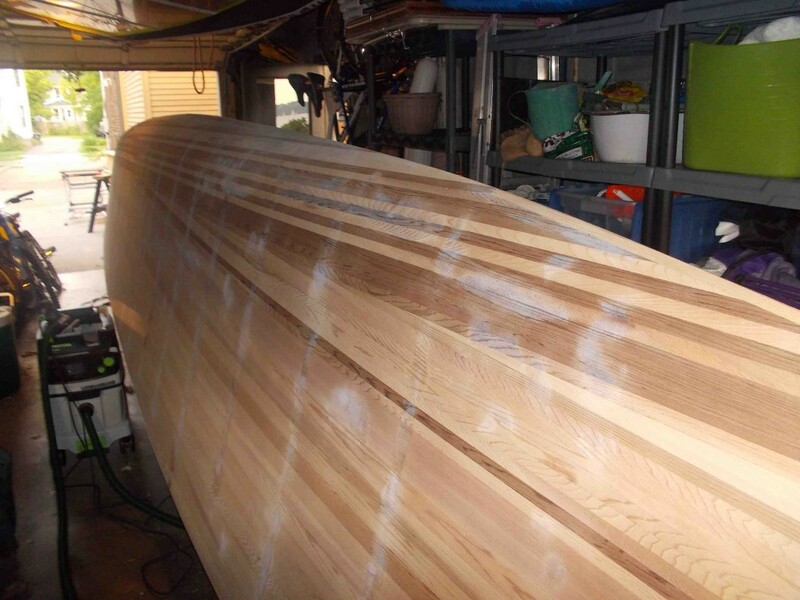 Remember you will need to have three coats of epoxy before you can get a good night sleep. 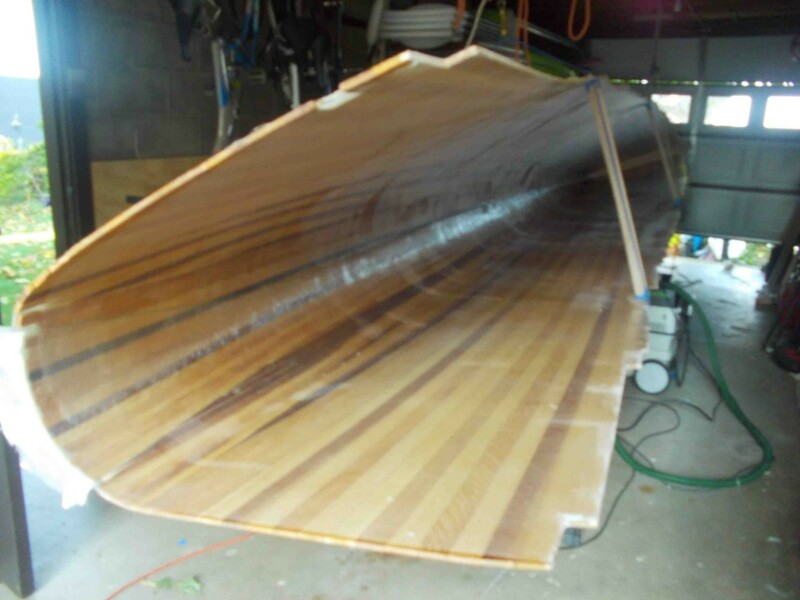 9) Make sure you have at least one gallon of epoxy per side. 4 gallons a hull. 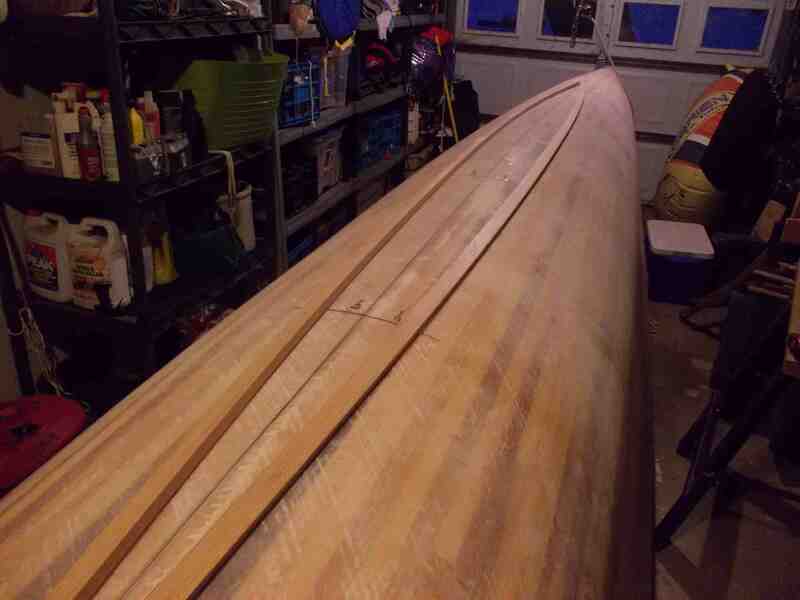 I started by applying epoxy 2/3 back working towards the back and then the front. This gave me about the right time to keep a wet edge and keep the glass in place. With a third person You can basically start in the middle and work your way out. For more details My reference book is Epoxy Basics with a variation for dealing with the 12oz biaxial. 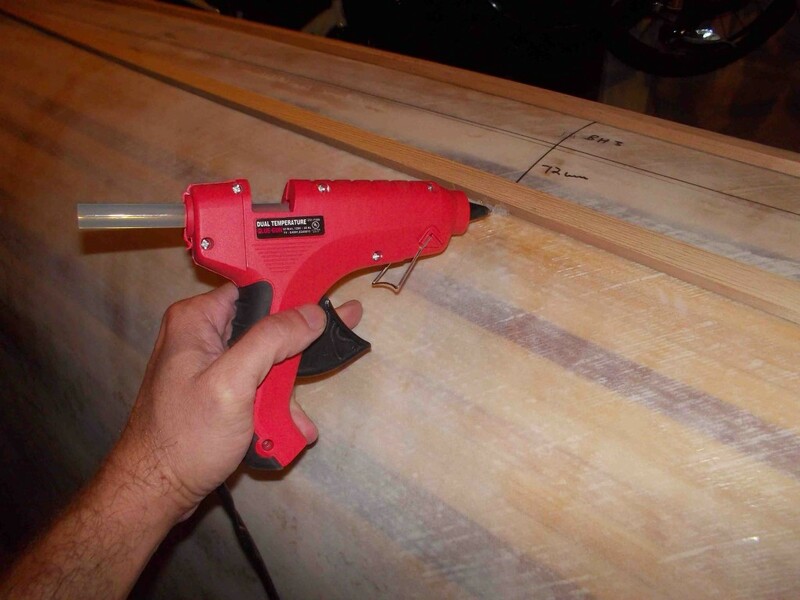 I found it almost impossible to get rid of a large number of bubbles unless I used a fiberglass roller. I did one side by myself and it took 2.5 hrs for the initial glass work. The second side, with two helpers, just under an hour and a half. 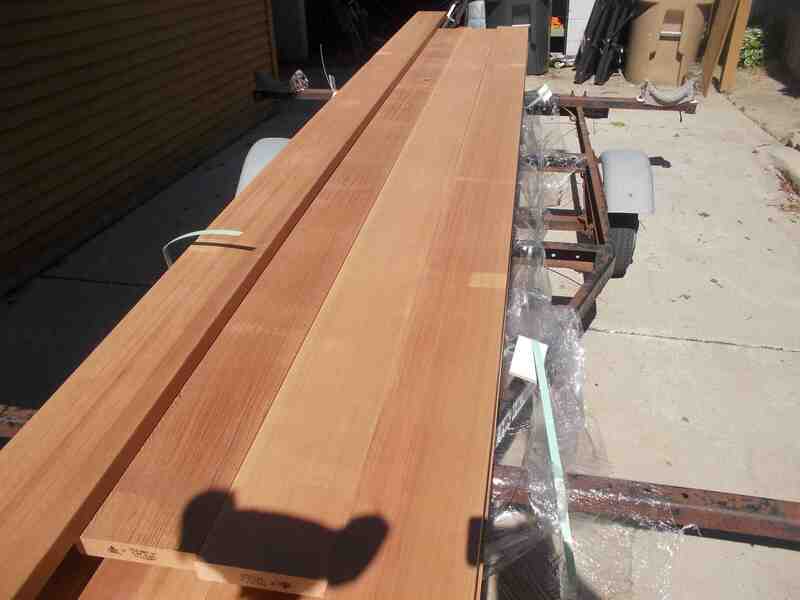 Then I used some hot glue to bond a cedar strip in place. I did this because I want to build the keels off the boat and bond them in place later. The finally after epoxying another strip on top I planed the surface flat to receive the first board. Now I go ahead and glue all the pieces together. 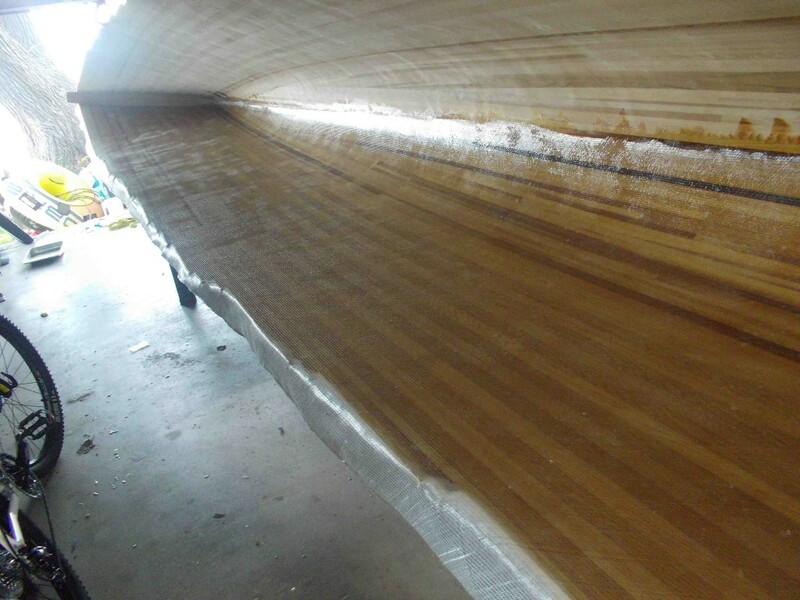 Make sure you very carefully tape around the keel so you don’t accidentally glue the keel to the boat at this time. If your boat is parallel to the water line, this is a good time to make sure the bottom of your keel is also flat and level. 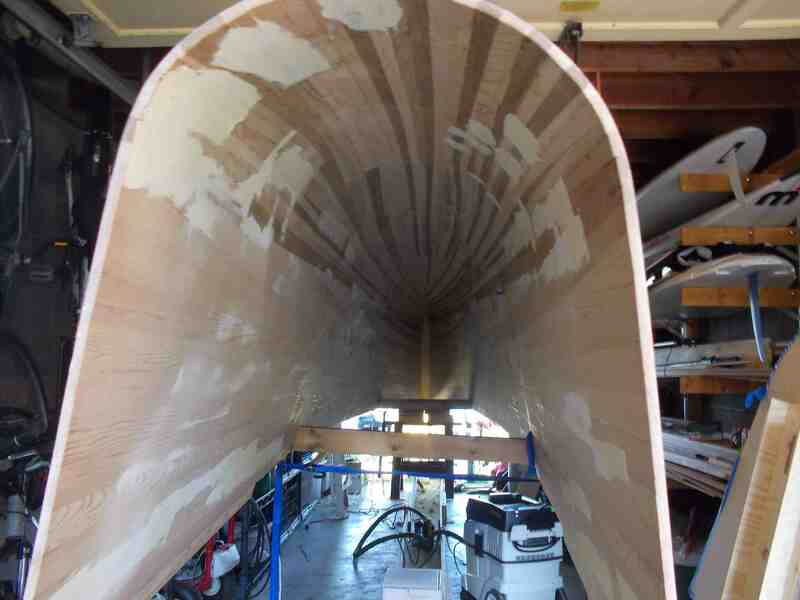 Adjust you keel bulkheads as needed. 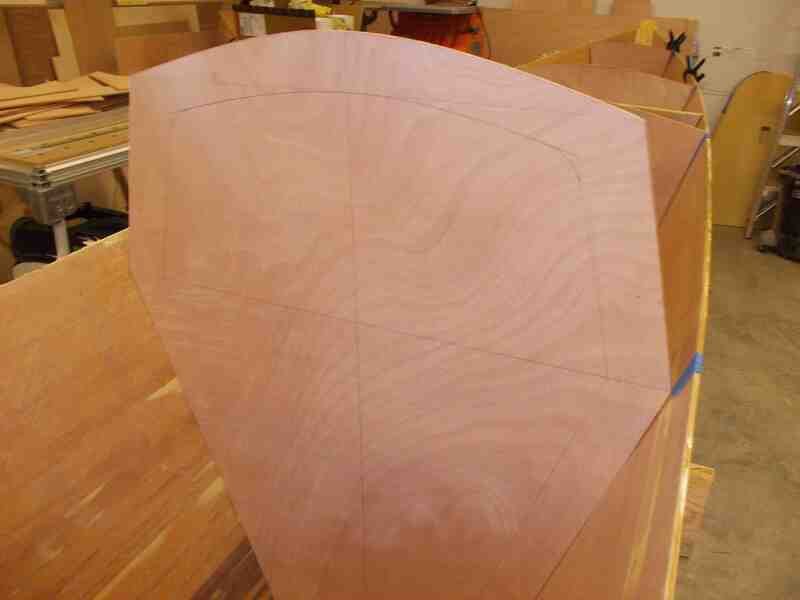 Ready for shaping then fiberglassing. 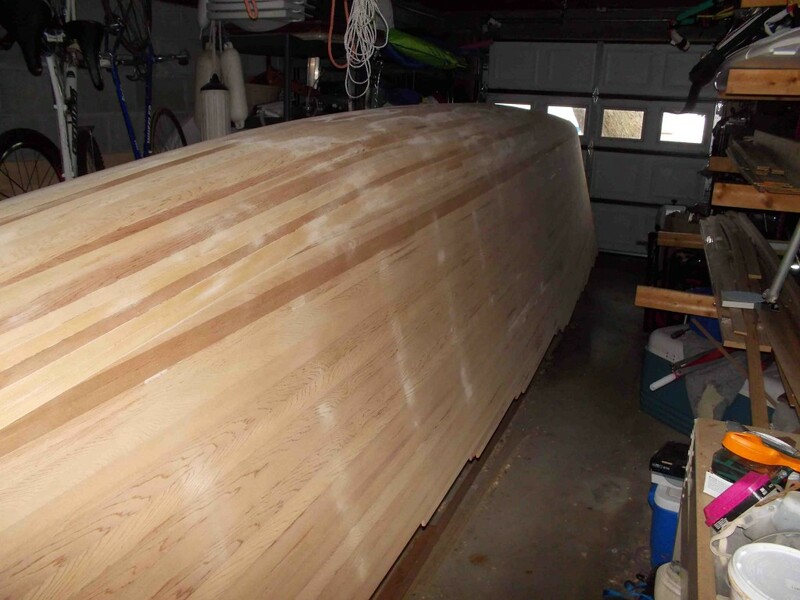 I am getting ready to move the boat to a nice heated garage over the winter. 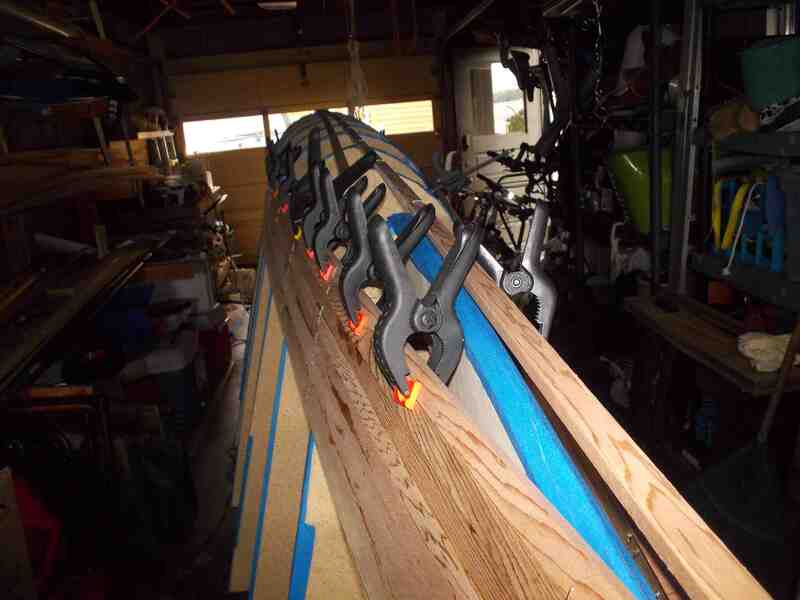 I decided that I would attach the keels after decking the boat to make it easier to work on the interior. 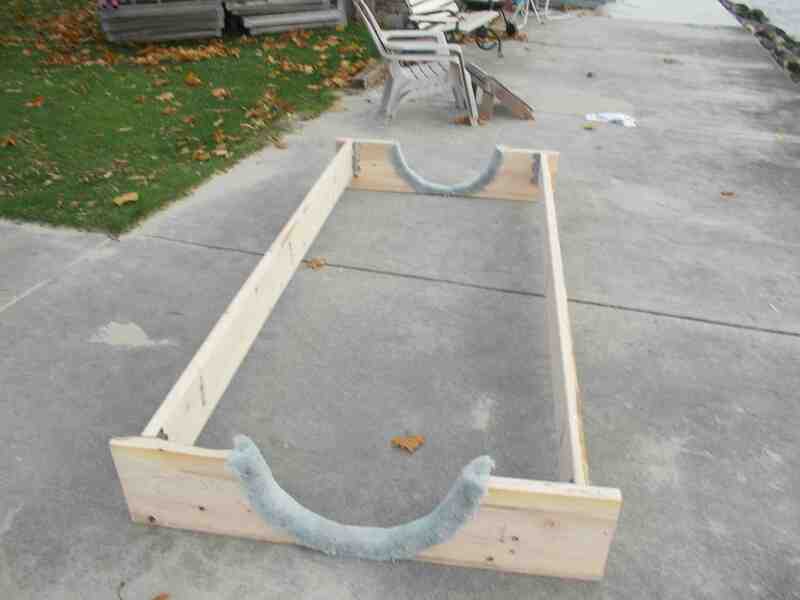 That has the additional benefit of making the cradle much easier to built. 4 metal corner brackets hold it together. I used frames 3 1/2 and 7 + 15mm offset to get the profile for the bunkers. 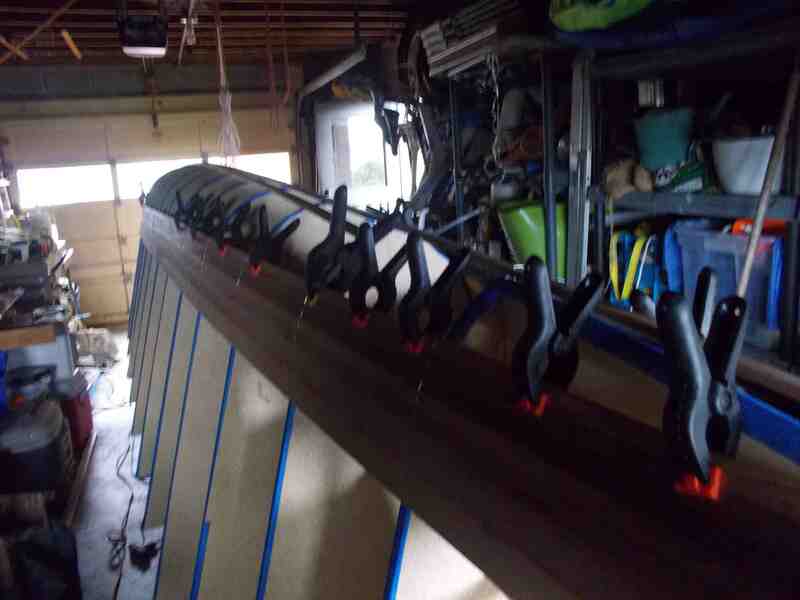 I spent the last couple weekends moving the boat and tools into the “Boat Barn.” I just started working towards installing the bulkheads and took some more notes and pictures. Here is a picture of why you want to fill all the staple holes. You can see an air bubble that made its way to the surface. These bubbles allow a direct path for the water to seep into the hull. Fixing them is not hard, but not having them to begin with is better. Here is a better picture of how the biaxial glass lays down and the filling required to sand it smooth. I wonder if adding a very light woven cloth as the top layer would make fairing easier. At this point I decided to sand all of the interior surfaces to 80 grit to simplify bonding the bulkheads. At first I thought I would only sand where needed, but decided to just prep the whole interior surface.